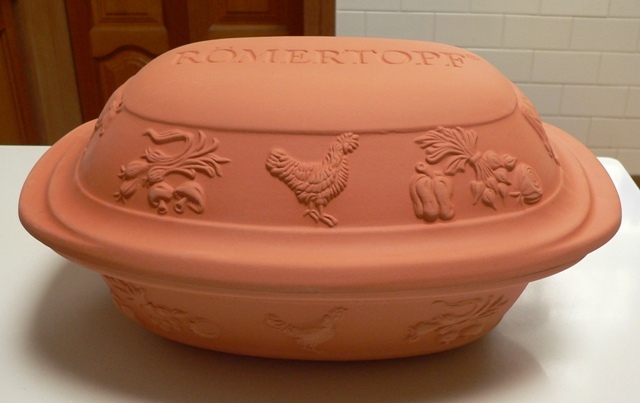 We’ve now had our Römertopf baker for over six months. We use our Römertopf at least once a fortnight and we’re astounded every time by how simple the process is. There aren’t lots of pots and pans to wash up, and it’s an easy way to make use of whatever ingredients we have on hand. 1. Soak the baker in cold water in the sink for at least 15 minutes. We put it in before we start prepping ingredients. 2. Rinse one cup of Basmati rice and soak it in water. 3. Chop vegetables, prepare any meat. No pre-browning or frying required. 4. Put the drained rice and vegetables in the bottom of the wet Römertopf, add two cups of stock, then lay the meat over the top. Or, mix the whole lot together and put it in the baker, then cover with liquid, ensuring all the rice grains are submerged. Often, instead of stock, we’ll use water, salt and seasonings. 5. Put the lid on and place the baker into a cold oven. Turn the temperature up to 200C with fan, and bake for about an hour and a half. Recently, I laid lamb shanks, seasoned with a little salt and pepper, over the top of the rice and vegetables and they cooked to sticky perfection. The boys ate it so fast that I didn’t get a chance to take a photo. 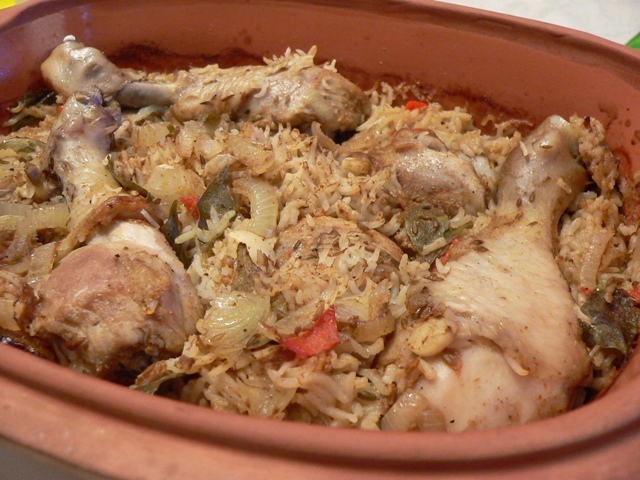 Last week we made a chicken biryani in the Römertopf, adding half a packet of purchased seasoning mix, some onion, garlic, tamarind and curry leaves. It was spicy, delicious, and just so easy. 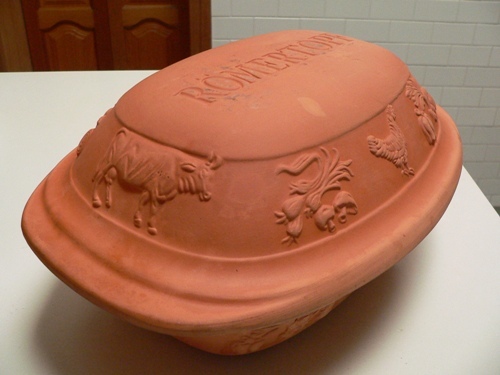 The Römertopf Rustico baker is still only $39 at Peters of Kensington, which I think makes it the bargain of the year. It has certainly simplified our mid-week dinners. The lack of added oil in the cooking process means that we’re eating better as well! 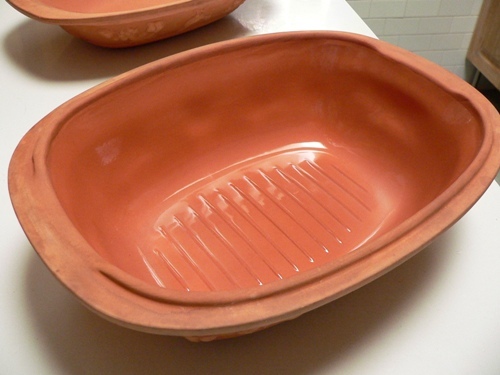 What are the advantages to using a Romertopf? Is it cooking quickly or easy cleaning or something else? Hi Lorraine, it just makes life easier for us. We soak the pot and then put raw cold food into it, and put it into a cold oven and walk away for a couple of hours. On a school night, that gives us time to help with homework! Because the pot has absorbed lots of water, it cooks the food by a combination of steaming and roasting, which means it’s juicier and tenderer than an uncovered dish in the oven. Also, by cooking in the closed pot, the oven stays nice and clean. You don’t need nearly as much fat to cook in the R, but we still find meats brown reasonably well. Finally, we put the whole pot, unscrubbed (we scrape off any excess food with a rubber spatula), in the dishwasher and it comes out beautifully clean. No soaking or handwashing needed. I love these so much I now have two (I can fit two side by side in our 90cm oven). Last night we had friends over for dinner. I put a leg of lamb over halved potatoes in one pot, and rice, chicken and chevapi sausages in the other. Both were quick to assemble, then I put them in the oven at 4pm, went for a walk on the treadmill, and dinner for nine was on the table by 6.30pm. Ok, I’m convinced, taken in….I have to see how I can get them here – Germany isn’t that far! Have a blessed weekend! Jules, they’re pretty big. We can only fit one in our oven height-wise, ie. we can’t have one on the top rack and one on the bottom rack. We can only manage to get two in because our oven is very wide. Just letting you know in case you’re thinking of putting them in at the same time. Our Rustico model stands about 18 – 19cm high. Reminds me (sadly) that my parents gave me their Romertopf when they were moving out of their house and I somehow didn’t pack it up properly and it broke during the flight to Sydney. Will have to invest in another one. That’s a shame, Alex! They’re not that expensive though, providing you get them at Peters. I’ve seen them for $80 – $90 elsewhere in Sydney! Oh, how wonderful to see one of these again. My mother had one when I was a child (still has it in fact) and used to make the most delicious rabbit stew and curries in it. Hahaha…Choclette, I don’t know that even cooking in a Romertopf would persuade Pete to eat rabbit! I’ve tried before.. I followed your instructions, bought the Romertopf from Peters and cooked lamb shanks in plenty of liquid but they came out crunchy. No idea whether they were still raw, and dark. Or cooked beyond repair. Help! Did you soak the pot first? Also, the temperature needs to be 200C with fan, cooking time about an hour and a half…maybe you cooked them too long? I will try again!! The schnoodle was deliriously happy though! I recently showed my old romertopf to my Nepalese partner and he was blown away by the fabulous result. Boy am I in the bad books though! Trying a new idea, i inadvertently ran warm water over the hot lid while, turning the hot food. The resounding “CRACK” engulfed in gloom. Am currently cooking again with it, so far so good, the lid managing to hold together! But I can’t see a store in Melbourne Australia on the net to start looking to buy a new one. I’d be grateful of your knowledge on where to buy one in Melbourne please? Pork Sweet n’ Sour, successfully romertopf’d ! Gentle handling helped to keep the crack injury intact for one more go! As I’m a potter, I have too much respect for physics to expect that crack to hold on indefinitely. I’ll try some major cookware suppliers here, and if needed, I’ll follow up your lead regarding Peter and a delivery to Vic.